Puff pastry is a magical dough that requires sweat and muscle. Through the layering (or laminating) of butter and dough, the butter gets trapped. When the dough is rolled out, shaped and put in the oven, the butter tries to escape by pushing apart the layers of dough. The tricky part when making the dough is keeping the butter between the layers of dough. It tends to want to squish out as you're rolling, which is where patience and the refrigerator help. 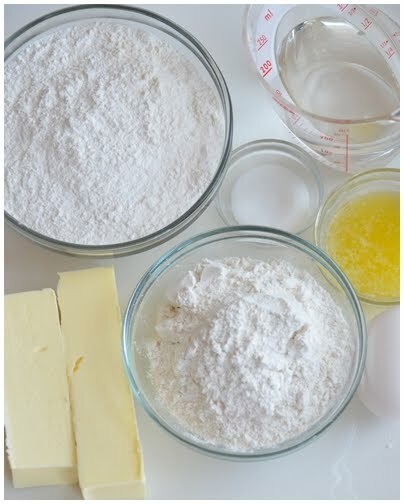 Though the method says to roll and fold twice, I'm happy if I get one roll and fold in and then put it in the refrigerator before the butter has a temper tantrum and starts smearing my rolling pin. Now that I have a block of puff pastry, what should I make with it? In a stand mixer fitted with the dough hook, combine the flours and salt. Pour in the water and melted butter. The dough will be shaggy. Bring it together into a ball and score an "x" in the top. Cover with plastic wrap and chill in the refrigerator for about 30 minutes. While the dough is chilling, place the butter between plastic wrap and form it into a square that's 3/4 inch thick. Place the formed butter in the middle and fold the arms over the butter, stretching the dough if needed. Seal in the butter. Using a rolling pin, press on the dough to seal the edges and flatten the square. Roll the dough about 7 inches wide and 21 inches long. Fold the top down and the bottom up to make an envelope. Turn a quarter turn. Roll again to 7 inches wide and 21 inches long. Fold again. Mark the dough with two fingerprints and chill in the refrigerator for about 30 minutes. Oh my god. I record a monthly podcast with my wine friend Nita and we talk about wanting to try puff pastry ALL the time. Now we have no excuses. This looks good and easy to follow. Thanks Shari. Wow. I'm impressed that you're making puff pastry by hand. That's no easy feat. As for a use... I love baked brie. Take a roll or wheel of brie, slather it with honey and dried cranberries, wrap in puff pastry. Bake at 350 for 40. Insane. 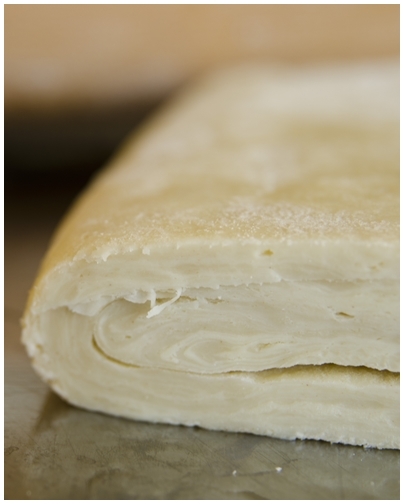 There is nothing better than puff pastry, especially when it is homemade! I was actually reading a recipe today where they laminated it with foie gras instead of butter. How good would that be?! ?